FOR VALUE RECEIVED, We, hereby sell, transfer, assign and convey to E. B. Allan  all of our right, title and interest of any nature whatsoever in and to a one-fourteenth interest in the real estate upon which is located the Town-site of the Town of Cody, Wyoming, and any adjoining land included in a certain agreement between the Lincoln Land Company of Lincoln, Nebraska, and Bronson Rumsey, Trustee of Buffalo, New York, bearing date the 24th day of September, A. D. 1901, and meaning hereby to convey the entire interest of H. C. Alger, deceased, as represented by a certain trust agreement between, Wm. 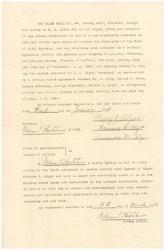 F. Cody, George T. Beck, Nathan Salsbury, George Bleistein, Horace C. Alger, H. Montgomery Gerrans and Bronson Rumsey as Trustee, bearing the date of 25th day of July, A. D. 1901. 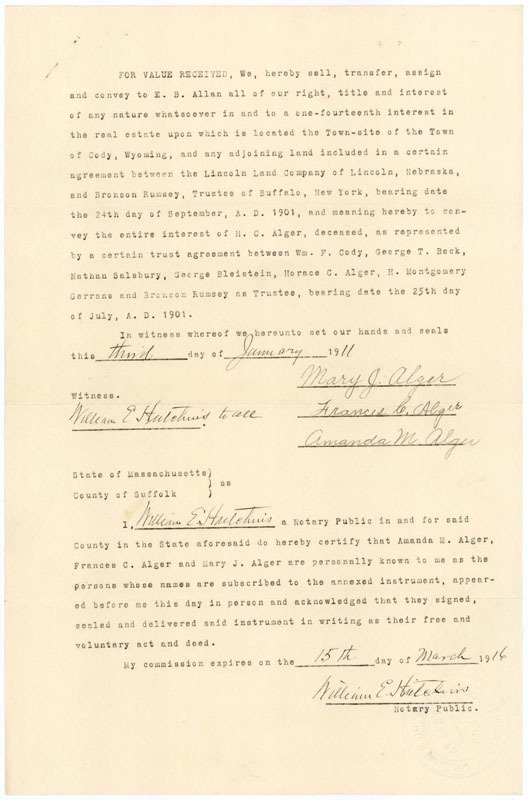 I, William E. Hutchins a Notary Public in and for said County in the State aforesaid do hereby certify the Amanda M. Alger, Frances C. Alger and Mary J. Alger are personally known to me as the persons whose names are subscribed to the annexed instrument, appeared before me this day in person and acknowledged that they signed, sealed and delivered said instrument in writing as their free and voluntary act and deed.